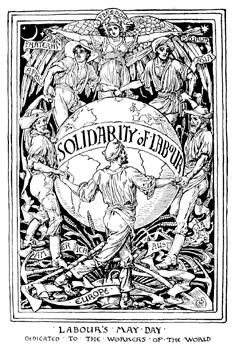 May Day has been repressed, banned and bloodied; it has been co-opted, appropriated as a symbolic ornament for dictators and authoritarian regimes at war with the labour movement, or turned into a harmless bank holiday. Despite this, labour celebrates May Day with confidence, for we know that society rests on our energy, our eyes, hands, brains and backs. It is the day when we insist that dignified work, health, food, housing, water, education and cultural expression are rights, not privileges, and we aim to have them. It has never been a day when we timidly, humbly approach judges and jailers or conclaves of finance ministers to convince them that unions are good for business or to plead for a bit more dialogue, if you please. It is a day when we say, not only is a better world possible, but that we will accept no less. May Day is the day when we celebrate our past, present and future by claiming our rights and our determination to fight for them. Let us celebrate it loudly and proudly on May Day 2017.